This FREE SCREENING takes place on Thursday 2nd April at 8pm in Pery’s Hotel, Glentworth St, Limerick. The screening will be followed by a discussion with the film’s director, Yotam Feldman who is on a tour of Ireland. 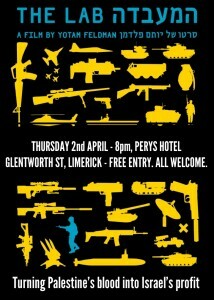 Hosted by the Ireland-Palestine Solidarity Campaign.